Many people do not realize the true purpose of a pharmacist. They depend on their doctors to completely look after their medical needs and just see a pharmacy as a place to buy medicines. This is very far from the truth. Doctors are experts in diagnosing and treating illnesses and injuries. Pharmacists are experts in medications, how they interact and how they affect the human body. Their educational and training requirements are just as strenuous as physicians, and they carry just as much responsibility in caring for their clients. That is one of the main reasons it is recommended you have a family pharmacist, just as you should have a family physician. All of your records can be overseen by one professional and accidents avoided. This can be especially important if you have more than one doctor prescribing your medications. Unfortunately, despite their best efforts, accidents do happen. Whether you call them pharmaceutical errors, medication errors or pharmacy malpractice, it is estimated that they cost the U.S. economy $70 billion each year. Over and above the monetary costs, the expense in human suffering is staggering: 1.3 million people are injured each year due to medication errors, and over 100,000 die. Why Do Pharmaceutical Errors Occur? It would seem that the biggest contributing factor to medication errors occurring is that many pharmacies today are being run like fast-food restaurants. In some of the big chain stores, pharmacists are expected to be able to fill as many as 50 prescriptions an hour. This is an astounding pace when dealing with something that can literally mean life or death. The simple truth is that corporations are working pharmacists too hard in the pursuit of profits to allow them to fulfill their traditional role of protecting patients from drug errors. They no longer have the opportunity to properly counsel patients and question them about their conditions, doctor’s instructions and what other drugs they may be taking. Medicines with similar names or packaging are being confused — Many medicines have names that sound very much alike or packagings that are nearly identical. As examples, Enalapril and Anafranil, or Seretide and Serevent sound very much alike but have completely unrelated uses. Medicines such as amlodipine and allopurinol have near identical packaging, but confusing the two could have fatal results. These types of mistakes account for 70 percent of dispensing errors. Out-of-date medicines — Overworked pharmacists and their staffs can fail to double-check the expiration dates on medications. Many medications lose strength with age, resulting in patients being under-medicated. 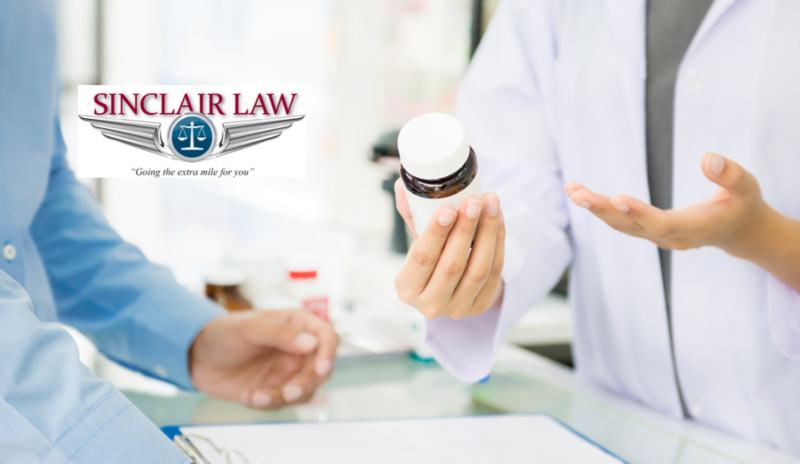 Compounding errors — Many times pharmacists are required to mix two or more medications or to dilute a compound before dispensing it. Missed decimal points in their calculations or confusing milligrams with milliliters can result in patients being drastically over- or under-medicated. If you suspect a medication error has occurred, you should contact your doctor and pharmacist immediately. Under no circumstances, though, should you return or surrender the misfiled prescription, and be sure to save the unused medication, the packaging, the pharmacy bag and the receipt. If you are asked to give a statement, politely refuse. Lastly, you should contact Brad Sinclair and seek his advice.